The Camden International Film Festival recently announced its line-up for the 13th edition, which runs Sept. 14-17 at venues in Camden, Rockport, and Rockland, Maine. Once again this festival proves itself to be one of the best programmed documentary events in New England. Among the 37 features on its schedule — around half from first- or second-time filmmakers — are 12 North American or US premieres and two sneak preview screenings by award-winning filmmakers. In addition, 35 short films and a dozen virtual reality experiences will be featured from 30 countries. That’s a lot for a viewer to cram into four days. Among the highly touted offerings is the world premiere of Dustin Nakao Haider’s “Shot in the Dark,” about a basketball court that is a place of refuge in a beleaguered Chicago neighborhood. It is the opening-night show; the director and “special guests” will be in attendance. Everardo González’s “Devil’s Freedom,” which reports on the terrifying, barbaric phenomenon of Mexico’s “disappeared” from the perspectives of both the bereaved and the guilty. Travis Wilkerson’s “Did You Wonder Who Fired the Gun?,” in which the filmmaker returns to his roots in Alabama to investigate his great-grandfather’s possible involvement in a racial murder. And, on a lighter note, there is Lili Fini Zanuck’s “Eric Clapton: Life in 12 Bars,” the story of the rock ’n’ roll guitar god as told by those who knew him best, including BB King, Jimi Hendrix, and George Harrison. For fans of documentaries, and movies in general, the CIFF is an essential destination. For more information go to pointsnorthinstitute.org/ciff. Al Gore’s recently released “An Unconventional Sequel: Truth to Power” reminds us of global ramifications of the climate change crisis. Steve Liss, Andy Laub, and Boston Globe reporter David Abel’s “Sacred Cod” presents a more personal and local angle on the subject. For centuries, cod fishing has been one of New England’s vital industries. Now, because of declining cod stock and regulations imposed by government agencies to sustain the populations, that industry is in peril. “Sacred Cod” gives equal time to both sides — to the agencies who are trying to understand and manage an ecological crisis and to the fishermen who doubt the government’s findings and see increased regulations as resulting in their own extinction. It also poses an unexpected compromise solution — dogfish. “Sacred Cod” has screenings coming up at three locations in Maine: the Stonington Opera House on Sept. 6, Curtis Memorial Library in Brunswick on Sept. 7, and the Hutchinson Center in Belfast on Sept. 8. All showings are at 7 p.m.
For more information go to www.workingfilms.org. Another documentary with a unique insight into the climate change crisis is producer Mark Decena’s “Not Without Us.” As “An Inconvenient Sequel” demonstrates, President Trump’s withdrawal from the Paris Climate Agreement was a crushing disappointment for those hoping for progress in confronting the problem. But the thousands of grass-roots activists from countries including Bolivia, Canada, France, Germany, India, Nigeria, and the United States who gathered in the streets of Paris in 2015 to demonstrate while the treaty was being negotiated already saw the agreement as flawed. The film details what critics see as the shortcomings of the agreement, and argues that real hope for change lies in the resolve of these activists who, in their growing numbers, will indeed speak truth to power. “Not Without Us” airs on the WGBH World Channel on Tuesday at 9 p.m. and Wednesday at 1 a.m., 9 a.m., and 3 p.m.
For more information go to worldchannel.org/programs/episode/not-without-us. Though the film does not explain where such godlike talent comes from — what film could — it does offer some insights into Michelangelo’s life (he lived to be 89), his passions (he was gay but celibate), and his struggles (the wranglings with Pope Julius II, as seen in Carol Reed’s 1965 film “The Agony and the Ecstasy,” were just a part of it). Most important, it shows his work. No matter how many times they are seen or reproduced, his statues of David in Florence and the Pietà in the Papal Basilica of St. Peter, and his tour-de-force fresco on the Vatican’s Sistine Chapel ceiling, never fail to awe. Even the flight of stairs he designed for the Laurentian library in Florence seems to embody the Platonic ideal — and Michelangelo was, according to one of the many experts interviewed in the film, a Neoplatonist — of what a flight of stairs should look like. 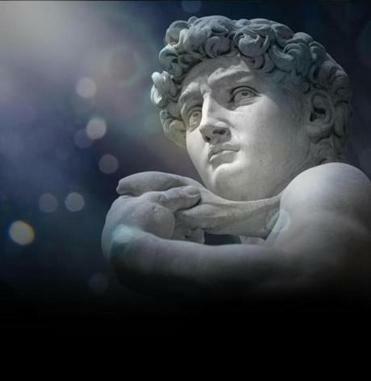 “Michelangelo: Love and Death” can be seen Sept. 3-30 as part of the Exhibits on Screen series at the Museum of Fine Arts. For more information go to www.mfa.org/programs/series/michelangelo-love-and-death.